A type of ceramic glaze that is intentionally crazed. Crazing is a crack pattern caused by thermal expansion mismatch between body and glaze. After the glaze solidifies (as the kiln cools) it shrinks more than the body. To relieve the tension of being stretched, it cracks. Crackle glazes are typically found on ware fired at low temperatures. Stains and other colorants are often rubbed into the crack lines to heighten the effect. Crackle glazes are best understood in terms of their oxide makeup, or chemistry. They almost always have very high levels of Na2O, and possibly K2O (collectively referred to as KNaO). These two oxides have the highest thermal expansion, by far, of those commonly found in ceramic materials. Feldspar is the key source. Not surprisingly, high feldspar glazes often crackle. Na2O is also present in the majority of frits. Some frits are formulated to have a high thermal expansion, these are invariably very high in Na2O (much higher than feldspar). Ferro Frit 3110 is an example, some raku crackle glazes have up to 90% of it! As firing temperature increases more kaolin and silica must be added (to source Al2O3 and SiO2) to reduce melt fluidity (and thus the tendency to run down off the ware). 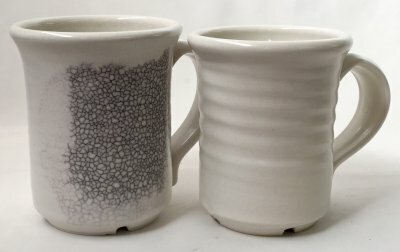 You can control the amount of crackle (proximity of the crack lines) by varying the amount of KNaO-sourcing materials in the glaze recipe. For example, for low temperatures, you could employ a blend of Frit 3110 and 3195 to make up 85% of the recipe (the rest being kaolin). The more Frit 3195, the less the crazing will be. For even better control enter your recipe into your account at Insight-live.com (making sure materials are named correctly so they link to the database), it can display the unity formula. Move the KNaO up (while holding the proportions of other oxides constant) to increase crazing, down to reduce it. Crackle glazes typically severely weaken ceramic ware, especially if it is thin walled (to the point it can be easily torn apart with your bare hands). Crackle glazes are definitely not suitable for functional ware (because of bacteria growth and leaching). This is crazing. Really bad crazing! These two glazes look the same, they are both cone 6 satin mattes. On the same porcelain. But the matteness "mechanism" of the one on the left is a low Si:Al ratio melted by zinc and sodium. The mechanism of the one on the right is high MgO melted by boron (with the same Si:Al ratio). The "baggage" of the mechanism on the left is high thermal expansion. And crazing (which drastically reduces strength and provides a haven for bacteria). The glaze is "stretched" on the clay (because it has a higher thermal contraction). When the lines are close together like this it indicates a more serious issue (I have highlighted them with dye). If the effect is intended, it is called "crackle" (but no one would intend this on functional ware). The glaze on the left calculates to a high thermal expansion so the crazing is not a surprise.